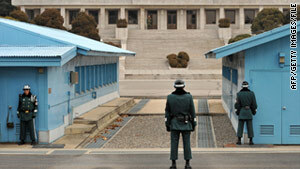 Soldiers from South Korea, right, and North Korea guard their respective side of the DMZ, separating the two Koreas. (CNN) -- North and South Korea opened working-level military talks Tuesday at the truce village of Panmunjom, South Korea's Defense Ministry said, marking the first inter-Korean dialogue in months. The talks are meant to help pave the way for higher-level military discussions. Colonel-grade officers from both sides will lead the meeting, which began around 10 a.m., according to the ministry. The talks signal a change in tone after tensions between the two sides escalated sharply last year. The South has previously said that it will demand that Pyongyang take responsibility for last year's military provocations and promise not to carry out any more attacks. Higher-level military talks will be held only if the North promises to refrain from further provocations. The Seoul government also has proposed holding inter-Korean talks between high-ranking government officials to discuss denuclearization, something the North has not yet responded to. Last month, South Korea's Unification Ministry said it had reopened communication channels with North Korea in the border area of Panmunjom. It was the first time in eight months the two sides had reopened the hot line. North Korea cut it off May 26 to protest Seoul's response to the March sinking of a South Korean naval ship. Tension rose again in November, when North Korea shelled South Korea's Yeonpyeong Island, killing two South Korean marines and two civilians. Pyongyang said the strike was in response to the South's navy firing into North Korean waters. CNN's Jiyeon Lee contributed to this report.